I will be hosting a remarkable Barolo dinner at Vivere Ristorante at The Italian Village in Chicago on Tuesday, July 17. The focus of the dinner will be cru Barolo from the last fifty years, as we will taste ten wines, ranging from the newly released 2008s back to the Fontanafredda 1961, one of the 20th century's greatest Barolo vintages. These are wines that I have taken from my cellar, bottles that I have been bringing back from the Barolo area over the past decade. I have put together a mix of the finest producers, such as Elio Grasso, Vietti, Marcarini, Roberto Voerzio and Fontanafredda, to name only a few, representing various Barolo communes as well as winemaking styles. 2008 Elio Grasso "Gavarini Chiniera"
1996 Poderi Colla "Bussia Dardi Le Rose"
The price for this dinner will be $175 per person, which includes tax and gratuity. Considering that a single bottle of the 2004 Voerzio Barolo will cost you more than that (if you could find it), the total charge for this dinner is quite reasonable. I look forward to seeing you at this special dinner, one we will all remember for quite some time, as we celebrate the best in Piemontese food and wine! Last week at Via Carducci, a wonderfully authentic trattoria on Chicago's north side, I hosted a Brunello di Montalcino dinner. The featured wines were new releases from Montalcino, namely the 2007 vintage of Brunello, the 2006 vintage of Brunello di Montalcino Riserva and the 2010 vintage of Rosso di Montalcino; there was a total of nine wines for the evening. These wines are brand new and while a few of them have entered select markets in America, many of them will not be available here for another few months. So this was a great opportunity to try the latest examples of these celebrated wines, sort of a miniature anteprima tasting, somewhat like the one I attend at Benvenuto Brunello in the town of Montalcino in February. The difference in this case being that while the tasting in Montalcino offered a lot more wines (more than 250), this evening in Chicago featured the wines with food, a nice plus! Especially when you pair Brunello with wild boar ragu and filet! We had an excellent turnout of 25 people. I knew a few friends who were there, but for the most part, I wasn't familar with those who attended. This was exactly the group of wine lovers I wanted at this dinner, as each individual wanted to try these wines for themselves, being lovers of Brunello. No one asked how many points these wines were awarded. No one cared what certain famous (or infamous) journalists thought of these wines. They tried the wines themselves and made up their own mind - how refeshing! I introduced a variety of styles from modern (Banfi "Poggio alle Mura") to ultra traditional (Lisini Rosso di Montalcino, Tiezzi "Vigna Soccorso") as well as an in-between style (Citille di Sopra). As with any good-sized group, tastes and opinions varied. For the middle course with the 2007 Brunellos, a few people loved the richness and power of the Banfi "Poggio alle Mura", while others opted for the elegance of the Ciacci Piccolomini "Pianrosso" (this is a particularly lovely wine) or the spice of the Citille. All well made wines, all representing Brunello beautifully in 2007, yet reminding us that these wines are the products of their terroir - both in the vineyard and in the cellar. The Tiezzi "Vigna Soccorso" Riserva, a marvelous, ultra traditional wine, was clearly a hit with this audience. This is not a fruit forward, toasty wine, but rather a graceful, subdued wine with beautiful structure and ideal balance; this is a nice reminder of what many Brunellos tasted like some thirty years ago, before a few producers introduced barriques to the mix. I had not had the privilege of tasting this wine previously and after making my initial notes, I thought the wine might be too low-key for consumers, but I was clearly wrong, as they loved it! If there was a clear favorite at this dinner, it was the Tassi Riserva "Franci," another beautifully made traditional Brunello. Fabio Tassi operates a wine shop/tasting bar/ in the town of Montalcino and also manages the enoteca in the fortezza, where you can find virtually every Brunello label in existence. In his spare time, he even manages to find time to make a little bit of wine under his own label! And what a wine this is. Of course, the greatness of any wine comes from the vineyards - Tassi has some outstanding plantings in Castelnuovo dell'Abate - but the final touches come in the cellar, in this case under the direction of enologist Alberto Antonini, one of Tuscany's most highly regarded winemakers, who ages this wine solely in grandi botti. This is a marvelously complex Brunello with impressive depth of fruit, excellent persistence, very good acidity and silky tannins. Above all, this is a wine of great breeding and finesse. You don't communicate the local terroir with heavy doses of oak, something both Tassi and Antonini understand quite well. Instead, you take a minimalist approach in the cellar and let the wine reveal itself, as it displays the sensual character of the Sangiovese grape about as well as any Brunello I have tasted this year. While this has the stuffing to drink well in another 20 years, you don't have to wait that long to enjoy this wine, given its elegance. One final note on this dinner and why so many people there loved the traditional wines, be they Rosso, Brunello or Brunello Riserva. I can't speak for everyone, but I can wager a guess, which is that these wines were being enjoyed in the best fashion possible - with food! Modern, oaky wines may get high scores from certain so-called "influential" magazines, but I'm positive the tide has turned, as many consumers are turning away from the decision makers at these publications and look instead to what they prefer. I've always favored the more elegant, subtle approach of traditional Brunello (as well as Barolo, Amarone, Taurasi and just about any Italian red wine, no matter how humble or famous), as I can drink the wine, not just take one sip for the purpose of a review. We all enjoy great wines paired with the proper food and the consumers at this dinner reaffirmed my belief in this as well as in the fact that traditional wines that play up to the food and do not overpower it are the most enjoyable of all. And isn't enjoyment why we pair wine and food together? P.S. One final note. 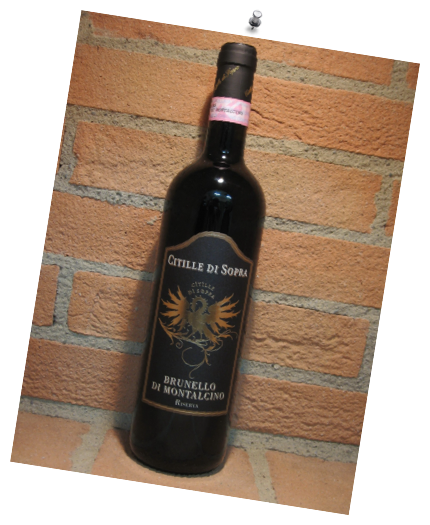 The 2006 Tassi "Franci Riserva" is not in this country and may not be brought in by the importer, especially as this is a very limited production wine. So you may have to order this from Montalcino. The price on the shelf at the enoteca at the fortezza is 120 Euro. That makes this wine one of the most expensive of all Brunello. The 2006 Tassi Brunello "Selezione Franci" (not a riserva) is imported in America and is less expensive; it's also a lovely wine in a similar style and one I highly recommend. So if you need to try the Tassi Franci Riserva from 2006, it will cost you a fair amount of money. But this wine is something special - for me, one word perfectly describes it. It is a revelation! P.P.S. I ended the evening with a bottle of 2001 Banfi Florus, a Moscadello di Montalcino, a sweet dessert wine of the area, made from Moscato. I normally don't care for this wine when it is young, at it seems a bit heavy as well as a bit simple. But I let this bottle sit in my cellar for about six years and when I discovered I still had it a few days before the dinner, I decided this was the perfect occasion to open it. What a pleasant surprise was in store for all of us, as the wine had rounded out and displayed remarkable complexity, tasting like an older Vin Santo or sherry, with just a trace of sweetness. Maybe that's the key with Moscadello - letting it age for five years or so before enjoying it. Over the past half-dozen or so years, my drinking habits have changed, as I now consume more white and sparkling wines than reds. Perhaps my palate has been assaulted enough by big tannins and high alcohol, but I find whites and sparkling wines not only so much more refreshing, but also more vibrant. At dinner time, these wines can actually pick me up as well as stimulate my senses. I love Champagne and I've been enchanted, especially over the past few years, by the Champagnes of the small growers, the ones made by recoltant-manipulant (RM), individuals that grow grapes and then produce the wines themselves. There are hundreds of these firms and while not every one of these can be counted on for greatness, more often than not a small grower Champagne is quite special, offering excellent complexity as well as individual style, a trait that defines notoriety in any wine. 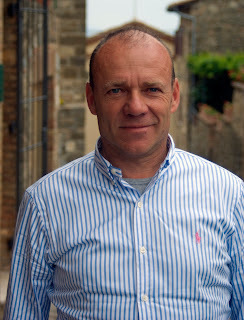 One of my favorite small growers is the firm of Larmandier-Bernier, managed by Pierre Larmandier and his wife Sophie. They own a fifteen-hectare (thirty-seven acre) vineyard in the town of Vertus, on the edge of the Cote des Blancs. I first tasted their non-vintage Blanc de Blancs in Piemonte a few years ago and was taken by its delicacy and finesse as well as its beautiful varietal character. As it was 32 Euro on the wine list we were at that night in Serralunga, I alos loved it for its value. I immediately wanted to learn more about this firm, so went to the website, which is one of the finest sites I've seen from any Champagne producer. This is an estate in which Pierre and Sophie farm according to biodynamic principles. "It is not for reasons of tradition that our approach to viticulture is completely natural; it is just because it makes sense," writes Pierre. "We are fortunate enough to work on superb terriors; it would be a shame if we didn't 'bring them to your glass.'" Pierre goes on to describe the biodynamic approach he favors; combined with beautiful graphics, this is an extremely educational and beautiful looking website. Their most famous cuvée is the Terre de Vertus Premier Cru Non Dosé. Non dosé means there is no dosage in this wine; thus the wine is extremely dry. Dosage - the adding of a small amount of base wine and sucrose - is carried out for most Champagnes, as it yields a rounder, less austere wine, so for Pierre to not add a dosage shows you the quality of the wine, as well as the grapes he farms. This is fermented and aged in oak casks and is produced entirely from Chardonnay from the estate vineyards. I finally had the chance to enjoy this wine - the 2007 vintage - at a lovely restaurant in Castiglione della Pescaia in Tuscany called Votapentole. This is clearly one of the finest seafood restaurants in all of Italy, so this seemed like the ideal situation to try this wine. I noted the intense aromas, rich mid-palate and its excellent depth of fruit. The bubbles are quite small and the finish goes on and on; there is a distinct chalkiness along with a striking mineral character. The wine is a great example of finesse, complexity and purity and is a superb Champagne. One note - this is made entirely from grapes from Vertus, a Premier Cru village. Thus the wine does not have the power of a Grand Cru Champagne, but I certainly had no problem with that, as I am generally more of a fan of finesse and purity than forcefulness. It may not be as intense as the biggest examples of Grand Cru, but given its complexity, balance and remarkable flavors, it rates just as highly for my tastes. This is an outstanding Champagne that will drink well for the next 5-7 years.